Did you know… QCI Vacation Homes has three types of boats available for chartering or rental! The majority of the fishing charters are offered through Masset Fishing Adventures, utilizing the completely outfitted 24 foot Sea West sports fishing boats. These boats are purpose built by Jenkins Marine out of Victoria BC and are very comfortable, offering private toilet and a heated cabin to get out of the elements. They comfortably handle one to four guests plus the guide and although rainsuits are less essential, still probably a good idea when out on the deck. These boats are available for rental from QCI Vacation Homes for qualified operators. If you’re not sure if you’re a qualified operator, please contact Gary at QCI to inquire. Looking for a smaller vessel that comfortably fits 2-3 fishing enthusiasts? QCI Vacation Homes also offers charters for one to three people on a smaller 19 foot Arima vessel. It offers a private toilet and although it is not heated, it offers shelter from the wind and rain. Guest do want to ensure they are dressed for the elements with rainsuits and warm clothing. For the live-aboard yachting experience! 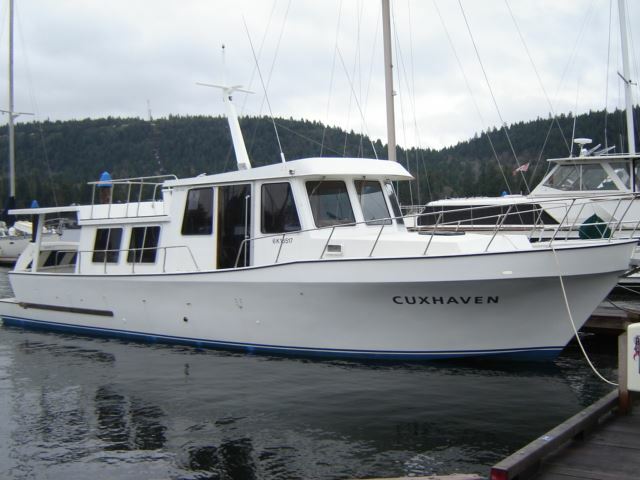 The “Cuxhaven” sleeps up to four guests comfortably, each with their own bunk in a single forward passenger stateroom. The dining area converts to a double bunk accommodating six, however four is the ideal number for maximizing economy and experience. Day trips can handle 7 guests. The Cuxhaven offers exceptional experiences to fishermen and photographers alike, offering a very comfortable platform to explore the area. The enclosed “head” or washroom, offers a full size shower and hot and cold running water! The main living area is spacious and very bright with lots of windows through which to view the surroundings. It has a well equipped kitchen as well as large BBQ with both open and covered decks available depending upon the weather. After a long day of fishing and sight-seeing, most people are happy to enjoy the gorgeous twilight views that you can’t experience in the city before turning in, however HD TV and laptop are available should guests wish to bring DVDs or simply review photographs from the day. Satellite radio and satellite telephone are both available.